There is a new era of Blues and R&B music reaching a whole new audience, those who love the genre and those who are experiencing it for the first time through the sounds and soul of Marc Broussard. There is a saying that "a person is an old soul." Many times personality, wisdom, outlook on life and life experiences are all catalysts in the formula when coining the phrase. 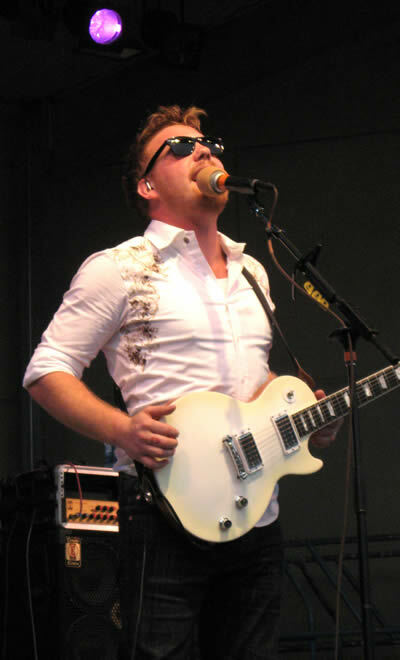 Such is the case of Marc Broussard. The twenty-six year old Louisiana native is most definitely an old soul when it comes to his music. Broussard has somehow been able to bottle the best of the bayou and expose, as well as educate, listeners to a genre of music that is uncomplicated, raw and real. No stranger to the music scene, Broussard is set to drop his latest release via his new home, Atlantic Records on September 16, 2008. Keep Coming Back harnesses all that truly encompasses a classic record. What makes this record different from Momentary Setback and Carencro is that Broussard, along with his band and studio musicians, have given fans what they've wanted for so long: a record that brings Broussard's live show and all its energy into a neat little package everyone can have all the time. This isn't Broussard's first foray into simplifying music. In 2007, S.O.S: Save Our Soul, showcased the singer and his band covering classics from Marvin Gaye, Al Green, Stevie Wonder and countless other music legends. It's now Broussard's turn to take that "old school" way of recording and apply it to his own lyrics, style of writing and performing. Keep Coming Back showcases Broussard's gift for channeling the multiple spirits of classic R&B and Soul into contemporary terms. Broussard and the band were determined to make Keep Coming Back their way and Atlantic Records couldn't have been more accommodating. "When signing with any label there are always concerns about the people you will be working with and if they're going to be around for the long haul. I do feel really good about the team we have working with us at Atlantic," Broussard notes. To maintain a level of consistency and the caliber of quality work Broussard is known for, in his contract he insisted on using his own producers on all projects. As a whole, the dedication, effort, A&R team and everyone involved at Atlantic has made it a very comfortable, creatively open and a confident environment for Broussard to showcase his talent. Recording is not so much going in with your touring band and a few session musicians to lay down tracks. For Broussard it's more like going in as a band of brothers to jam for an extended period of time. Not only are producers, Calvin Turner and Justin Tocket respected for their craft, but they are also friends of Broussard. That type of trust in professional and personal relationships helps break down barriers that some artists have during the creative process. "It's easy when you and the artist have the same vision and goal. I trust Marc to deliver the songs. We can have differences of opinions along the way, but we always have the same goal. I trust Justin with the sound, just as I do Marc with the songs. I can produce and say whatever I want to say all day. But four years from now that cover is still going to say Marc Broussard. We're lucky that we trust each other enough to have our own opinions of this project, yet never lose sight of the main vision for it," Turner explains. Creating a record in eleven days is somewhat unfathomable by industry standards. However, as Chad Gilmore (Broussard's drummer) elaborates, "The way we record and capture the sound, no exaggeration, it doesn't take as much time as one might think. When you hear about those projects taking months to finish it's because they are sitting there piecing and analyzing every little aspect of every track." Broussard echoes Gilmore's take on the project noting that contrary to what a lot of people may think, it is actually harder to go into the studio to create a record that is not like a live show. "You go in and do what you do as musicians, and then the producers come in and start copying, pasting and chipping away at every little note. And truthfully, it takes the humanity out of the project." For this record, it was straight out of the gate running for Broussard, the band and his producers. The band had never played the majority of the twelve tracks before recording the CD. Broussard first made demos of the tracks, and then brought them into the studio for the band to hear. At that point everyone wrote their chords and charts, copied their parts and the eleven day recording process began. Broussard and the band turned off all the computers and recorded strictly on analog tape. Thus, it gave the recordings the feel, texture, contrasts and movement of a live vibe. "Naturally there is something old school about our vibe, it's not forced in the process of the five of us, plus the two other musicians that played with us," Turner emphasizes. There was obvious confidence and ownership of this project for Broussard and the band to record in this fashion, as he elaborates, "When you walked into the room you saw all the computers screens were black. It gave everyone that sense of awareness. There was no going back and overdubbing tracks. Everyone knew this is the way it was going to be throughout the recording. I really thought it was special that we were doing it this way." Turner and Gilmore both agreed that as musicians the way they recorded makes one mentally more cognizant of getting the entire take rather than the one note, and having the capacity as musician and artist to capture that moment in time while recording. The result of all the effort and thought is a cohesive project that captures the simplicity of music and lets it's character shine through. Guest appearances by Sara Bareilles on Why Should She Wait and the reunion of Broussard and LeAnn Rimes on When It's Good add just a touch of femininity to balance out the storylines of both tracks. It's truly hard to nail down Keep Coming Back's general vibe. It's heart pulse is pure soul, but there are glimmers of country, blues, streetwise rock, heartfelt love songs along with all the live enthusiasm you find at Broussard's shows. Hard Knocks is rough around the edges and street smart. Keep Coming Back makes you want to dance. Evil Things is truly one of the most honest songs on the album. The storyline is one of mistakes made in life, and how the love of that one special person can erase all the bad and allow all the good of a person to resonate through. It transcends the evolution of love and maturity of human spirit. For the listener, Keep Coming Back has body and substance. It has a solid foundation minus the sterility present in most modern day records. It has taken the party vibe of Broussard's shows and translated them in a way to not only be a great listen, but also to set the standard for other artists to get back to the roots of recording. The music doesn't have to be perfect in every way, every note doesn't have to completely in tune. This is what Broussard and the band wanted to achieve with this project, the authenticity of playing live. As a whole the band feels quality of music doesn't necessarily reflect flawlessness of music. In order to be authentic, the music has to have the ability to fluctuate. "The industry started to buy into this notion that everything has to be perfect all of the time, and that's not the case at all. Some of our favorite music has screw ups all over it, and that's really endearing to the tracks. It's about the total body of work, not one or two songs. It always has to be about the songs," according to Broussard. Keep Coming Back exemplifies quality of musicianship on all levels. It's not glossy; it's not overproduced, nor is it cookie cutter. It's what Marc Broussard and band do every night live: tell their truth. Testing the waters with the new material, Broussard recently played a free outdoor show in Pittsburgh, Pennsylvania where he previewed such tracks as Hard Knocksand Real Good Thing for the audience and received a great response. Staples like Rock Steady and a rousing AC/DC Back in Black intro to Home got those who weren't already dancing by this point of the evening on their feet in front of the stage. The two hour set was a combo Broussard classic, snippets of Keep Coming Back, as well as some great covers of classics like Lovely Day. For those just out to enjoy the summer night or die hard Marc Broussard fans, it was a perfect way to spend a wonderful August night under the stars. Being an old soul in so many ways is one thing that makes him stand out above so many other artists in the industry today. When asked if your career ended today how would he want people to remember him, Broussard responded, "I would want my legacy to be one of kindness and generosity and passion for not just what I do as a musician but also for the people around me..."